With irrigation, growing thirsty alfalfa in the desert is possible. Yet, extensive reliance on irrigation means that depletion of surface water or groundwater sources is more than likely a consequence, especially in the face of climate warming. Researchers are finding ways to capture the total hydrological picture in Earth system and land surface models, to understand the impact of irrigation on regional drought vulnerability. Over the long term, irrigation may not significantly drain the global mean water supply. But the story changes when zooming in on the regional and local view. Research led by Pacific Northwest National Laboratory scientists found in areas that extensively rely on irrigation, surface water or groundwater supply might wither, depending on the supply source. And regions that depend primarily on surface water irrigation (rivers, lakes, reservoirs) will be more vulnerable to drought as the impacts of irrigation on water supply are most significant during times with low water flow. "By the end of this century, as the climate warms, the rising demand for irrigation water and increased variability of the water supply may lead to regions with a severe shortage of water for irrigation," said corresponding author Dr. Maoyi Huang, a climate modeler at PNNL. The Earth's water cycle is affected by energy exchanges via evaporation, transpiration, condensation, and precipitation, to name a few. Humans alter that hydrological cycle through water use demand-irrigation being a large use-and cause changes in water supply by affecting evaporation and runoff. Understanding how human water use would respond to global warming and its combined effects on the hydrologic cycle is important for better designing mitigation and adaption strategies to the global change in the future. Studies to investigate the joint effects of climate change and irrigation at the global scale are limited. Recent multi-model inter-comparison efforts considered the effect of climate change and irrigation on global hydrology, but lacked the assessment on groundwater resources. This study is the first to look at the impacts of irrigation on both surface water and groundwater resources globally using the CMIP5 climate scenarios. "Pumping surface water for irrigation depletes surface water but enhances groundwater. Pumping groundwater for irrigation has the opposite effect. 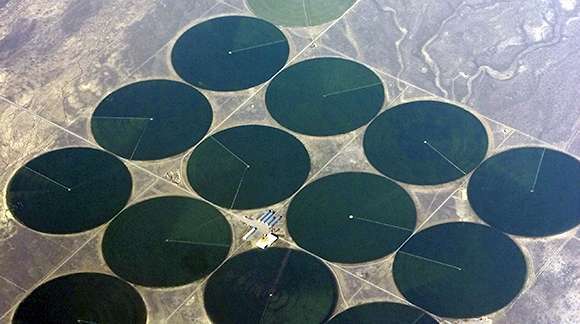 We found it is important to account for irrigation and its water sources when assessing climate change impacts on water supply," said Dr. Guoyong Leng, a PNNL postdoctoral scientist who led the study. Land surface models (LSMs) are an integral component of the General Circulation Models (GCMs) and Earth System Models (ESMs). Few LSMs have the ability to account for human impacts, such as irrigation and groundwater pumping, yet incorporating those activities is important to understand the impacts of continental-to-global-scale environmental issues associated with climate change. During previous investigations, PNNL researchers and collaborators developed and implemented a groundwater pumping mechanism into the Community Land Model 4.0 (CLM4) and applied it successfully to the United States during an historical period. In this study, the team first set up and validated CLM4 in terms of runoff generation at the global scale; then, they calibrated the parameters associated with the irrigation module that features dynamic groundwater pumping in CLM4 at the global scale against water use data compiled by the Food and Agricultural Organization (FAO) from census information. Finally, the team conducted three different sets of numerical experiments driven by bias-corrected climate projections from five GCMs to analyze the effect of irrigation on global surface water and groundwater resources. More land will be used in the future for agricultural production to support an increasing global population. Using an Earth system framework for the future, researchers will explore the combined effects of groundwater pumping, changing irrigated areas, and specific crop types and crop growth on global hydrology.